Yesterday we had our first meet-up! Shannon, Katie, and I (Amanda) attended a kimono fashion show, The Tradition and Culture of Kimono, by Yu Ugawa. It was a very good and informative show. 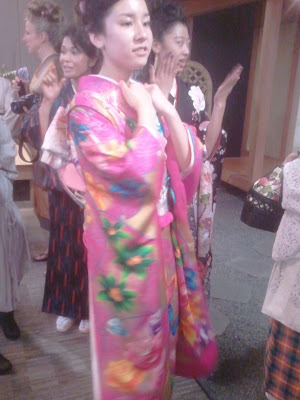 I think many people there learned a lot about kimono. 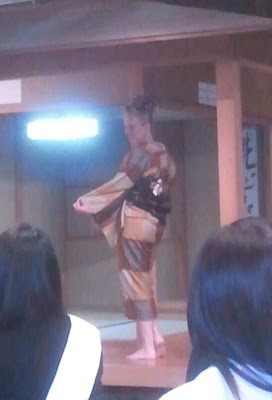 The show started out with an "Iki" (chic) kimono coordination show. The fashion show included styles for men and women, informal and formal, traditional and non-traditional. I apologize now about the photographs, I don't have a fancy camera! This is most of the photos, but you can see all of them at the club's Facebook group, here. Men's kimono were shown first. There were two models, but my other photos didn't turn out well. After the models showed their kimono, Yu Ugawa and her daughter Mariko Kayama came out and showed the audience how the decoration on men's kimono is restricted to the nagajuban and inside the haori. And then they demonstrated how to put on hakama. 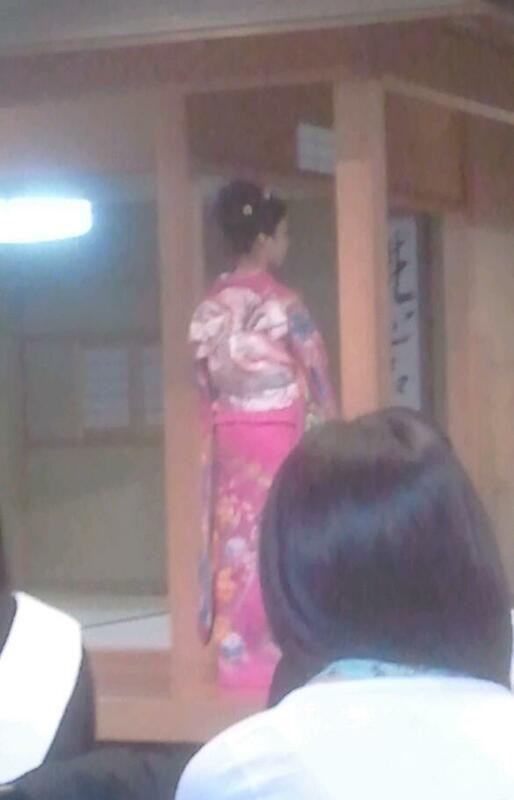 Then informal women's tsumugi kimono was shown. The model wore matching kimono and haori, in Ugawa Sensei's "new kimono" style, worn short and with flip flops. 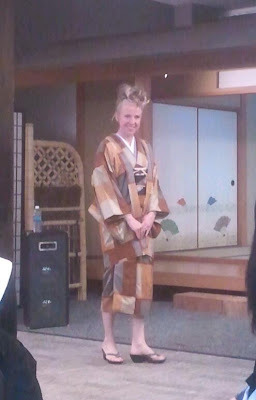 The model took off the haori to show the black embroidered satin obi. 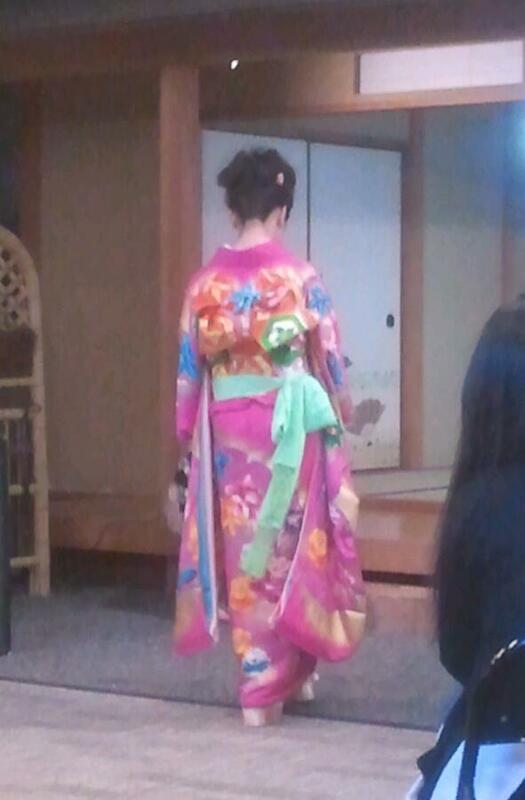 This model wore a furisode in the style worn for juu-san-mairi (13 years old ceremony), using a child's maru obi. 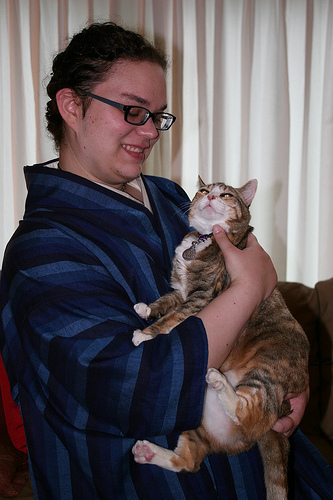 The child's maru obi was removed and replaced with a fukuro obi. Furisode worn in non-traditional way, with bright leggings and pumps. The models of the "Iki" fashion show. Left to right; two men's kimono, non-traditional women's tsumugi, men's hakama style, furisode, Yu Ugawa-sensei, non-tradtional furisode, modern style furisode, men's denim kimono, and Ugawa-sensei's daughter Mariko Kayama wearing non-traditional komon. A woman was kind enough to take a picture of me, Katie, and Shannon during intermission. 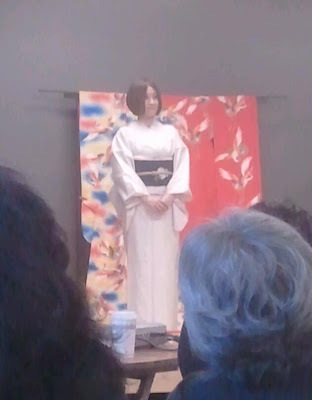 Next was a kimono presentation in which Yu Ugawa-sensei showed various kimono styles, from informal to formal, and showed how different obi coordinations for each ensemble. 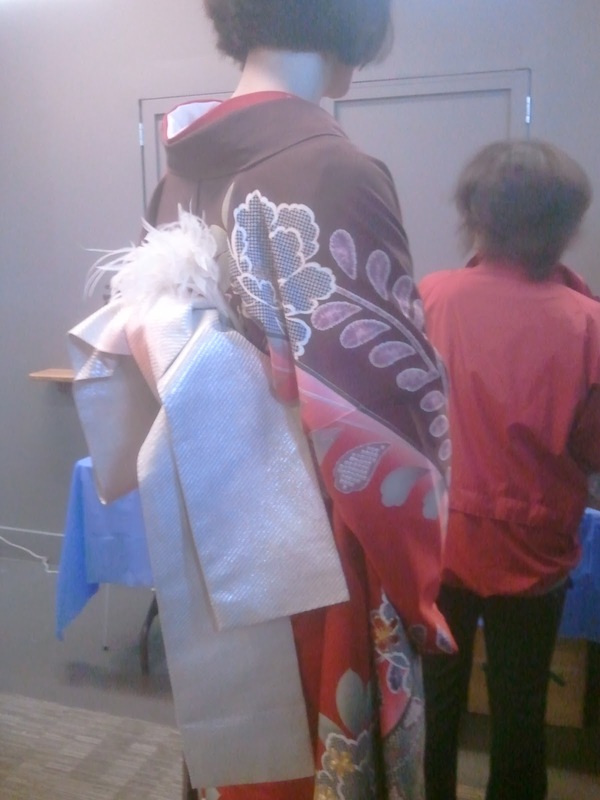 Two tsumugi kimono; white tsumugi with dark blue embroidered obi, and a dark tsumugi with iris obi. 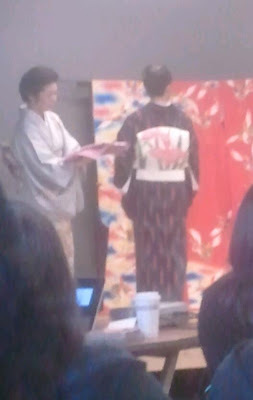 Ugawa-sensei showed the tsukesage kimono worn by the emcee, and explained the location of the patterns. My personal favorite, a soft green houmongi. They demonstrated changing the obi to a bright orange to liven up the ensemble for a party. 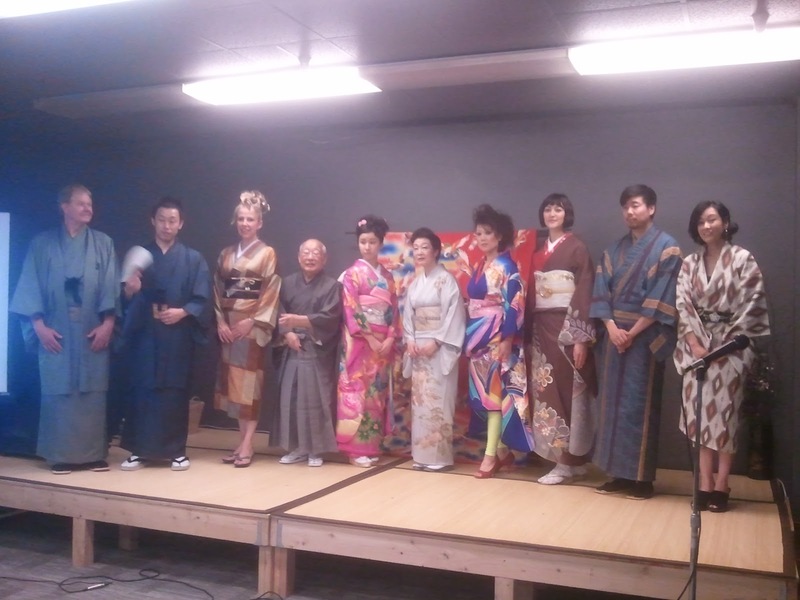 Wedding ensemble and furisode together to show the slight differences. 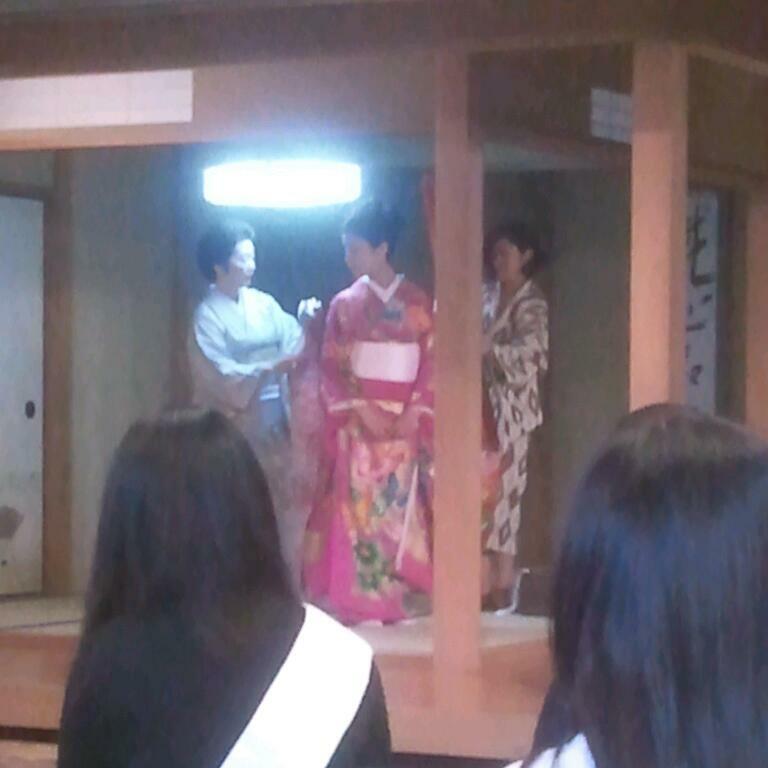 The models for the kimono presentation lined up to show their obis. 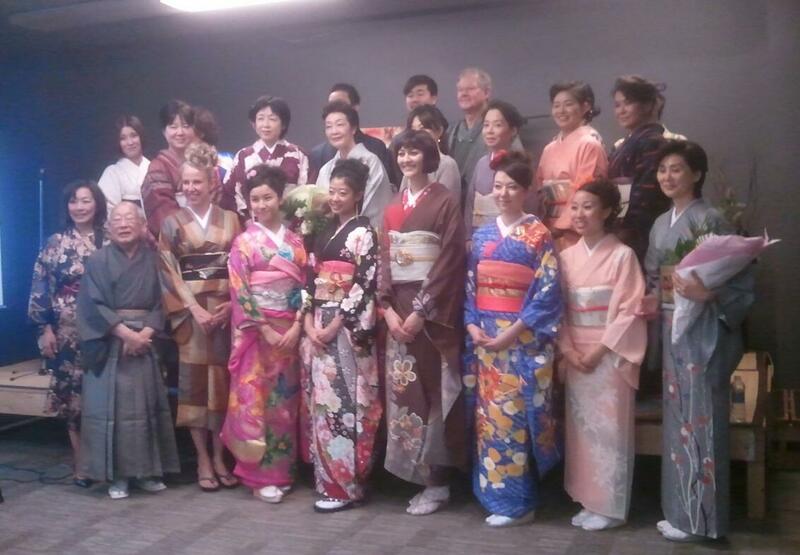 All of the kimono show participants. After the show, Ugawa-sensei said that she was happy to see people in the audience who wore kimono, and she asked us to come up to receive a special gift. She showed the audience each of our ensembles and explained what we were wearing to the audience. We then received a gift of cute gauze handkerchiefs! It was unexpected, even the emcee said she didn't know it would happen. There was then a Q&A session, the audience asked some good questions. 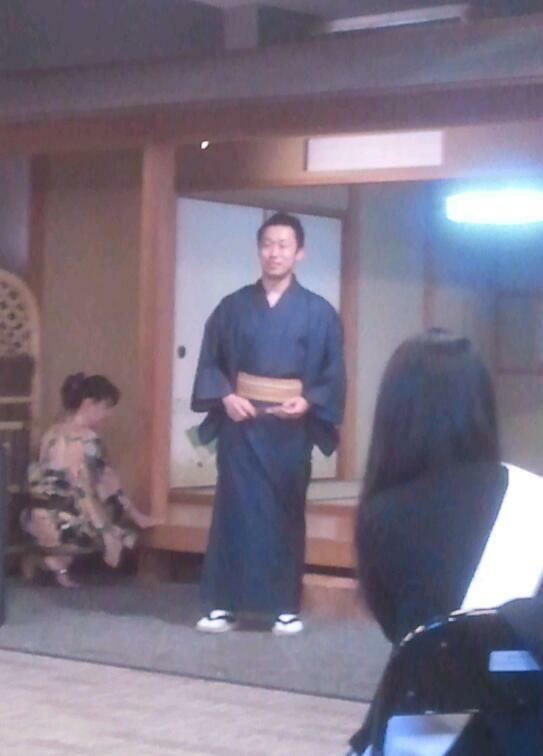 Ugawa-sensei even called on us when someone asked how long it takes to learn how to tie your own obi. We enjoyed some matcha tea, small cakes, and sandwiches, and browsed around a section where kimono and kitsuke items were offered for sale. We talked to many people and had a good time just chatting. After the show, the models relaxed a little. These two were overheating in the fully lined furisode! The girl in pink said she had a lot of cotton padding underneath, which I could see when she pulled at her collars. It must have been an inch worth of cotton padding along her collarbones! 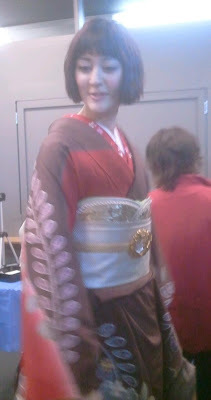 We got to see this furisode ensemble up close. The model is very tall, so she was dressed in a modern way with the hem of her kimono at steep angles. She has two han'eri, a massive gold obidome, and a gold and pearl obi kazari in the shape of a false obiage (she had a green obiage underneath, but it can not be seen). She had a silver hanhaba obi with a feathery decoration in back. Katie and another girl taking pictures (I apologize, I forgot her name already. I even asked Katie at least a dozen times on the drive home, but still forgot!) 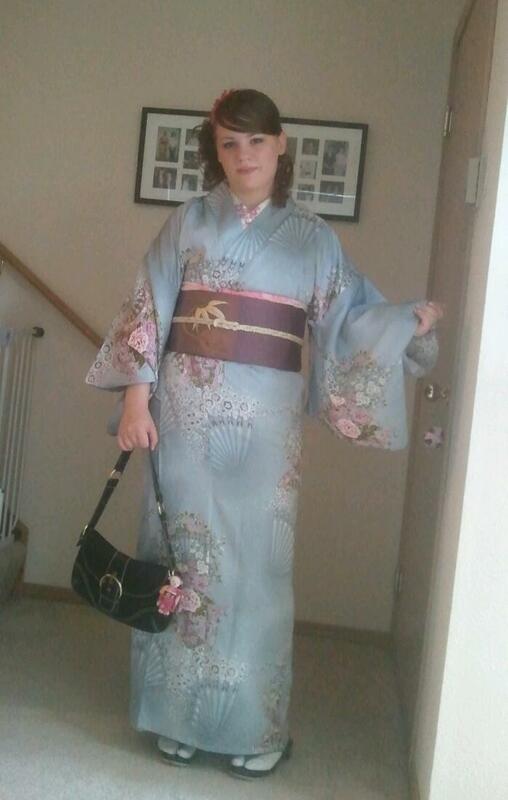 Katie wore a butterfly hitoe kimono with a cute butterfly ro obi! Sorry, the only front pic I got was the group photo above! 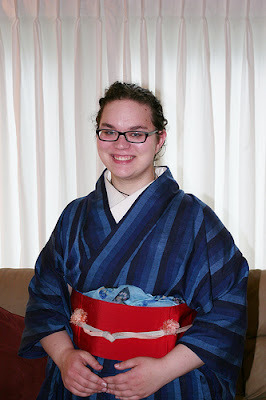 Shannon wore a blue stripe hitoe kimono she made right before the kimono show, with a red tsukuri obi and scarf-obiage. Her kitty doesn't approve of taking photos! 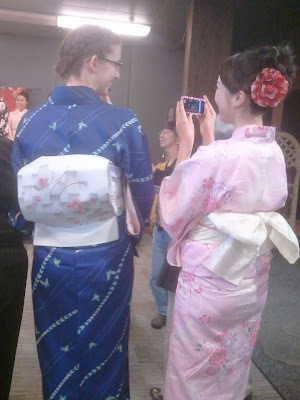 And I wore a blue polyester hitoe with a flower-fan pattern and a purple bamboo obi. I don't know why I didn't realize we all wore shades of blue..! We had a lot of fun! I look forward to our next excursion! 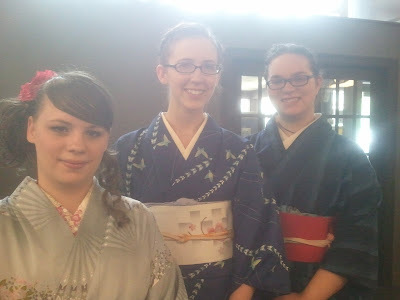 The girl in the brown furisode wasn't so very tall ;) Without zori, I bet she was only an inch or so taller than Katie or me. I definitely didn't expect to get asked as many questions as we did. It seems like a lot of people are a little intimidated by kimono, but seeing people wear it casually like we did, or the girl in the lace haori, makes it less scary. I was so happy we went - and even better that we found such nice things at Hosekibako! (You should put up that okobo shot ^^) I'll do a kitsuke post up here in a few days with the pink iromuji. I want to try it out with a few different obi to see what it looks like with the different colors; it's a very versatile shade of pink. Oh.. :-( Do you not like the purse? I actually got a lot of compliments on it with my ensemble.